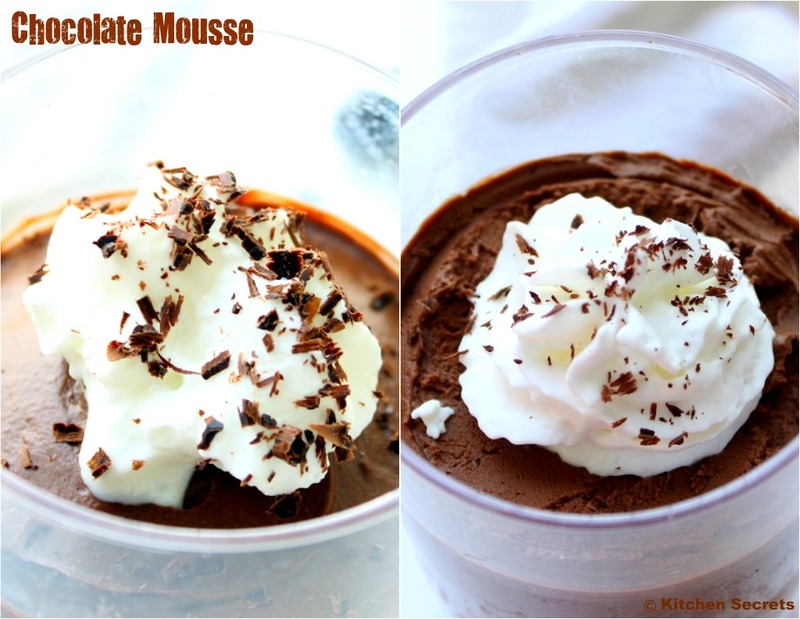 Mousse is a delectable dessert and if it is a chocolate mousse , it's double treat for chocolate crazy maniac like me .. Main thing, it's light, creamy as well as yummy and just melts in ur mouth..Heaven !!! I've adapted this recipe from food network which involves some steps but the dessert is awwwesome. I had used half of the measurement which pretty much yields 2 servings , and thatz what I's aiming for... NJOY !!! Chill the glass bowl in the freezer to be used to beat the cream. Gather the chopped chocolate in a medium heat proof /heat resistant bowl. Fill a sauce pan with 1 inch or so of water and bring to a boil and then to a slow simmer. Place the chocolate bowl , on top of the sauce pan, not touching the water. Stir the chocolate until it's melted and turns glossy n smooth. Do not keep the heat in medium / high, else u would end up getting burnt chocolate mixture. Whip the cream in the chilled bowl until it holds soft peaks . Do not overdo / get the steady peaks, else, the mousse would be dense. Cover the bowl using a plastic wrap and refrigerate until it is ready to use. Now mix the water and the coffee powder. Whisk it in a separate small bowl. Add the eggs n egg yolks in an another bowl and add a pinch of salt and sugar. Beat the mixture well for a good minute using the electric mixer. Now set this bowl again on top of the sauce pan ( keep the heat in low )and whisk it for 3 minutes / until it turns fluffy and hot to the touch. Remove the bowl from the heat and start beating on high speed until the mixture turns thick n creamy and thick ribbon falls from the beater when checked. i.e. the batter takes time to reach the surface of the mixture forming a ribbon like pattern. Add in the coffee mix at this stage and mix well. Now fold in half of the egg mixture and slowly mix it. Later , add the rest of the mixture and fold in carefully. Likewise, add in half of the whipped cream mixture and fold in with the mousse. Then ,add the rest of the whipped cream in batches, and fold in , so that the mixture is smooth, light n fluffy. 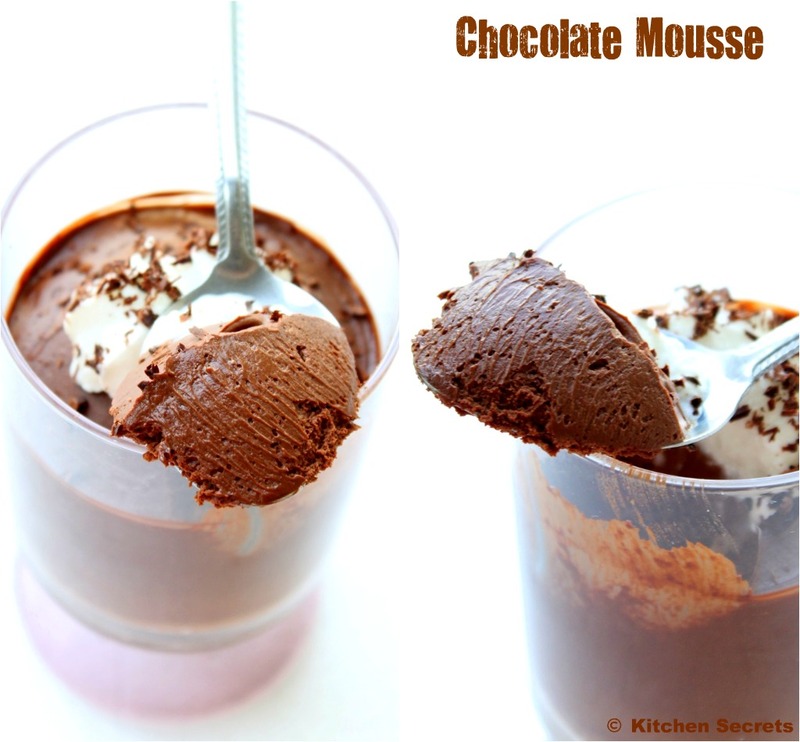 Transfer the mousse into the serving glass and serve with a dollop of whipped cream and shaved chocolate on top. Do not add coffee powder if using bittersweet chocolate, that would make more bitter. Always keep the sauce pan simmering over low heat. Personally, needs more than 1/3 cup of sugar if it is bittersweet chocolate . 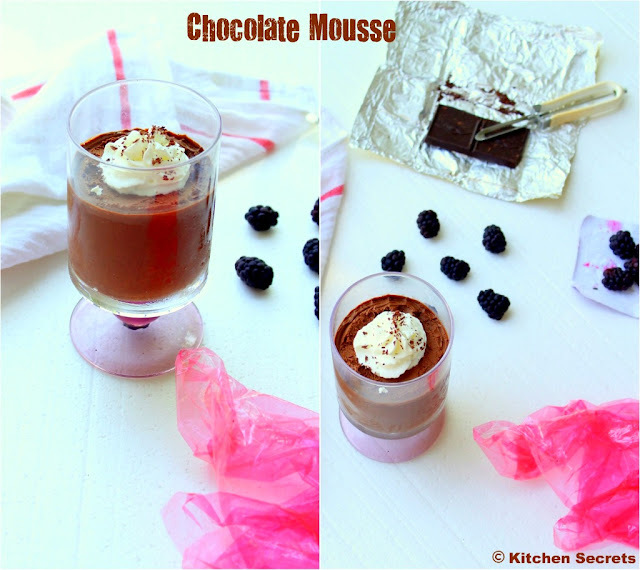 Extra ordinary clicks.love the mousse.wud love to have it immediately. Yum, I cannot stop staring at your pictures. They are just super drool-worthy !!! What a treat dear! Luscious n truly tempting!! 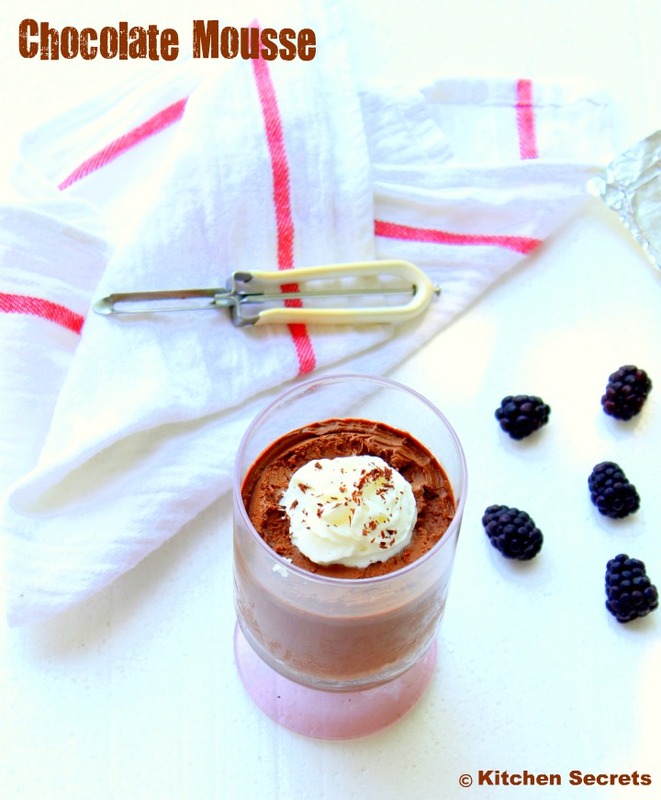 Chocolate mousse looks awesome perfect. 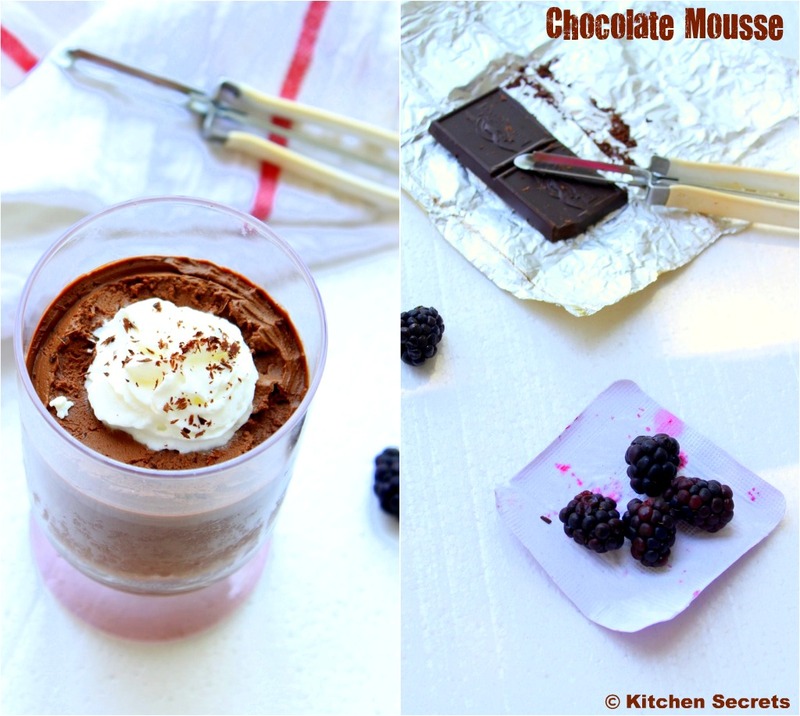 Omg, feel like finishing that irresistible mousse, love it soo much, incredible.. Wonderful clicks of yummy chocolate mousse. How I wish I was there to have one helping :) ! so tempting mousse !! wonderful and lovely pics !! பார்ப்பதற்க்கு வேலைபாடாக தெரிந்தாலும் படங்களை பார்க்கும் போது அப்படியே எடுத்து சாப்பிடனும் போல் இருக்கு.படங்கள் செம அழகு!! Love the colours !!! very inviting and beautiful pics. you have me hooked gal- this is a treat to the eyes and must have tasted decadent !! treat to eyes n to taste buds..
OMG shanavi...Fab, luscoius, delectable dessert!!! Im drooling looking at these awesome clicks!!! Shanavi I love blackberries and blueberries are all very beautiful, it's winter now and I have only dried, now I mention that I explained the ingredients for the rhubarb jam or nalca in comments, if you want the recipe for kuchen write and tell me , big hugs and see you soon.